The article, “For Your Patients-Concussion: Why Some Neurologists Are Calling ‘Foul’ Over Criteria for NFL Concussion Settlement,” (October 4, http://bit.ly/NT-NFLconcussion) is riddled with inaccuracies and misleading information — a disservice to the thousands of former NFL players that have benefited from and are relying on these benefits. For example, one doctor quoted throughout the article bemoans the fact that he is not an approved physician to conduct examinations under the settlement. What is not mentioned is that he was not a board-certified neurologist or neurosurgeon, which is required by the settlement agreement. He also claimed to have “evaluated more than 500 players” who opted out of the settlement, which is impossible since fewer than 100 former players ultimately opted out. A second source claimed that NFL attorneys were challenging his reports as part of audits. This is false. All audits are conducted by the claims administrator — not class counsel or the NFL. Furthermore, the article states: “To diagnose level 1.5 or 2, the examining neurologist must take the player's medical history and then administer either the Mini-Mental State Examination or Montreal Cognitive Assessment.” Again, this is false. Both of those screening tests are not required or even discussed as part of the settlement. Finally, the article fails to note that the settlement is overseen by a federal judge, independent claims and BAP administrators, and two special masters. The fact that 649 claims totaling $569.3 million have been approved in less than two years — when the NFL estimated it would pay $404 million in the first 10 years — is strong evidence the settlement is working effectively. I appreciate Mr. Seeger's interest in our concerns. Space in the article did not permit addressing the terms of the settlement in detail. The audits are initiated by the claims administrator and 56 percent of all claims have been audited. According to audit rule 7c, the NFL parties (attorneys for the NFL) may provide materials for the audits. The NFL has 30 days from the day a monetary award has been received to appeal; 100 payable claims have been appealed by the NFL attorneys. The reporter asked me what was involved in the neurological exams. I replied that we take a neurological history and do a neurological exam, which includes a brief cognitive assessment, either the Mini-Mental Status Exam (MMSE) or the Montreal Cognitive Assessment. In some of the appeals of my claims, attorneys for the NFL stated that it is not possible to have level 1.5 or 2.0 neurocognitive impairment with MMSE scores of 26 or 29, which is not factual as people can score 29/30 or 30/30 and have moderate to severe memory impairment. Mr. Seeger states that 649 claims totaling $569.3 million have been approved. He did not mention that $348,836,266 has actually been paid; many level 1.5 and 2.0 neurocognitive impairment claims have not been paid [see https://www.nflconcussionsettlement.com/ViewPDFdoc.aspx]. I want to thank Mr. Seeger for his response to the article, “For Your Patients-Concussion: Why Some Neurologists Are Calling ‘Foul’ Over Criteria for NFL Concussion Settlement.” First and foremost, it would have been nice to have Mr. Seeger list any disclosures, including any compensation he received from the lawsuit. I also want to correct and address some of his comments. It appears that he missed or chose to ignore a major focus of the article — the process of evaluating these retired NFL players. The process includes a fictional diagnosis, outdated guidelines, and a lack of standard of care in evaluating dementia. For example, neuroimaging, blood work, etc. are not required to look for secondary and reversible causes. And there is no award for traumatic brain injury, which from our group's research on more than 500 retired players is likely playing a major role in the players' neurocognitive issues. Perhaps that is what is meant by level 1, 1.5, and level 2 neurocognitive impairment. Unfortunately, without an accurate and true diagnosis retired alumni, are unable to get the proper treatment and care they desperately need. Furthermore, the settlement numbers that were quoted are inaccurate. According to the NFL concussion settlement website, a total of 498 claims, totaling $348,836,266 have been paid. The site provides a complete breakdown of the conditions cited (death with CTE, ALS, Alzheimer's disease, among others), and includes claims paid, on hold, or denied. The letter also implies that I evaluated more than 500 players for the lawsuit. This is not true. Since 2010, prior to the settlement, our group has evaluated and treated (through health insurance and in research studies) more than 500 retired alumni for signs of traumatic brain injury and other causes of neurocognitive impairment and neurodegenerative disorders, as well as headache, sleep disorders, and behavioral disorders. We were contacted by attorneys representing approximately 10 players who were seen prior to the lawsuit being settled to see if they qualified for awards. After discussing things with my colleagues and considering the patients were in a research protocol, we determined that my participation would be a conflict of interest. Those patients were turned over to an MAF [medical assessment form] neurologist who is a subcontractor working with our practice. As was the case with Dr. Evans, this individual was later terminated without cause by the claims administrator. I'd also like to clarify my status with the opt-out players. I have been contacted by the attorneys representing those players as an expert consultant. Due to conflict of interests outlined above, I will not be evaluating such players and still maintain that if I were to choose to apply for MAF status I would be declined due to my work in the past with professional athletes. In fact, there are stipulations in the concussion lawsuit that prevent this. In addition, through my work as immediate past president of the Florida Society of Neurology, I am aware of at least three physicians in our state who were denied MAF status due to their work on medical legal cases and/or with athletes. Finally, my active board status was addressed in September 2018. The perspectives and opinions, presented here as part of the independent reporting of Neurology Today, do not necessarily reflect the official opinions or positions of the American Academy of Neurology or the publication. 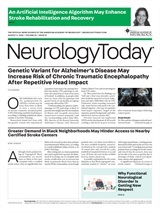 Neurology Today18(22):6, November 15, 2018.